Why Don’t I Release Many Scripts/Plugins? People have asked this question so many times over the years, but I never really gave any direct answers. I figured that it wasn’t that important. Finally, I decided to answer it exclusively on RPG Maker MV (quite a while ago now). This is an updated, tweaked version of that blog entry. It mostly has to do with confidence. Back in the 2K/3 days, I was one of the most confident people you’d know. I had a blog – surprisingly popular in its own way – with the first comprehensive event commands tutorial online. Sadly, though, that was fairly short-lived because the web host I was using at the time sold without notice and everything on it was wiped. All the tutorials and resources were backed up, so the old site reincarnated as RPG Maker Master on Blogspot, but it just wasn’t the same. I’ve had numerous knockdowns throughout my life (I won’t go into details with any of them). Some have been more serious than others, but I’ve always bounced back more determined than ever, yet not quite as confident. Each time, an iota of that former self-confidence eroded. I’d never heard of Ruby script prior to RPG Maker, let alone knowing enough of it to develop anything with it. Obviously, I had to research and frequently asked for help on how to do certain things. On many of the forums I belonged to, I was met with condescension, arrogance and presumption. Honestly, it left me feeling humiliated and quite pissed off. One time I asked for a skeleton script – something that I could work on and learn from – for a kind of "word dictionary". I was told that it was "boring" and "useless". One person even said he would probably do it for me, but I needed to expand the idea with extra features to make it more "interesting"? And even when I said I could add those features myself, as I just wanted a simple script to be able to add and delete words, and so on, the same thing resulted. The whole idea (along with the project it would be used for) was eventually trashed! As a result, I withdrew from forums completely (but still lurked). 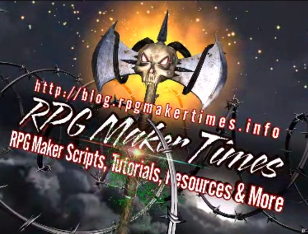 Many of the scripts/plugins I release are ONLY on the RPG Maker Times blogsite. I’d say 80-90% of all my scripts/plugins aren’t even made public. Even with that, 80% of the plugins I have written will either be kept as game-exclusive or won’t be released. I often wish I’d have gone into game development when I was much younger. I had ample opportunity to do just that. My confidence was much higher, my programming skills were much stronger, and my focus was much sharper. I never really had the family support when it came to starting up my own game dev company (again, I had an opportunity for that) because they didn’t understand, couldn’t relate, didn’t think it would be self-supporting, and shot down any and all ideals I had about it. Family (and their support) IS important to me and without that, I eventually and regrettably went down a different path. I’m almost 50 now – almost in my twilight years, but still youthful in spirit – so I don’t give a damn about what family thinks or whether I have their support or not because the one person who counts most in my life does support me. My other half. She’s been nothing but supportive, as well as encouraging and galvanizing. Although she doesn’t quite understand the nuances of scripting or game development, not once has she shot down any ideas I’ve had; she’s only offered suggestions and constructive criticism where it’s needed. Hence, I will be releasing more of the plugins and resources I’ve created for MV here and on the blogsite when I have the time. And, while I’m at it, I will be finally completing an RPG Maker game!